This event may be of interest to many. Week 5 Seminar: Eric Tagliacozzo – ‘Chinese ‘Illegalities’ in Colonial Southeast Asia: Lessons from the Fin-de-Siècle Maritime World’. Our seminar this week is in association with the Global China: New Approaches lecture series and is by Eric Tagliacozzo (Cornell University). It is titled ‘Chinese ‘Illegalities’ in Colonial Southeast Asia: Lessons from the Fin-de-Siècle Maritime World’. It’s on Wednesday, October 29, 2014 at 4:15 p.m. in The Senate Chamber, Aston Webb Building. Abstract: How have Chinese been typecast as ‘illegal’ in colonial eyes in the various parts of Southeast Asia? What has been their significance as a community, and how has this changed over time? To what extent is Chinese ‘illegality’ a myth and to what extent has it corresponded to any historical truth? My presentation will examine the interface between overseas Chinese and the colonial state writ-large in Maritime Southeast Asia, particularly in the Dutch East Indies and British Malaya, over the course of the late nineteenth and the early twentieth centuries. In the first part of my talk, I will look at various sites of contestation, as this pertained to this ethnic divide across the Insular World of Southeast Asia. The second part of my talk looks at the archipelago through ‘secret societies’ and ‘illegal trade’, as these concepts were understood by colonial governments. Finally, the third part of the lecture then focuses on the border itself, partially maritime in nature and partially overland, as Chinese communities on the evolving frontier were classied by these states. In total, I hope to show some of the ways in which the maritime Southeast Asian milieu dictated new ways of type-casting Chinese communities, and how this fits into larger taxonomic processes of the state at a time of evolving modernity. 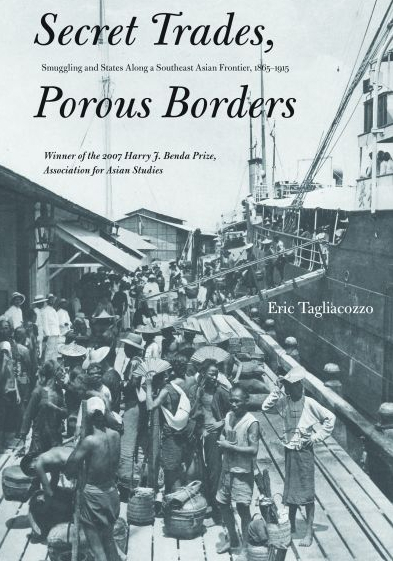 Image copyright Eric Tagliacozzo/Yale University Press. 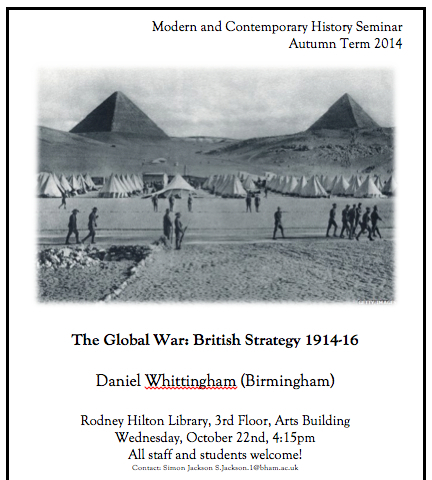 Week 4 Seminar: Daniel Whittingham – ‘The Global War: British Strategy, 1914-16’. Our seminar this week is by our own Dr. Daniel Whittingham on: The Global War: British Strategy 1914-16. See you at 16:15 in the Rodney Hilton Library, on Wednesday 22 October. All are welcome, and there will be drinks. 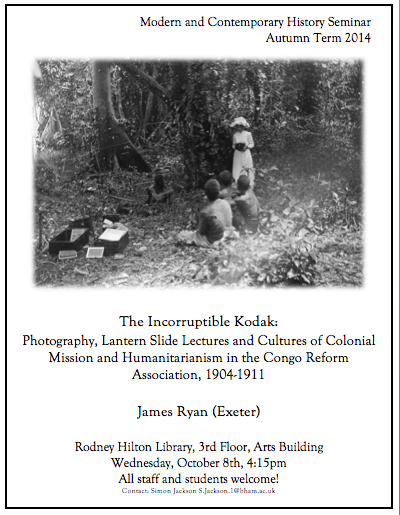 We kick off the new year in the Modern and Contemporary History Seminar Series (full calendar here) with a talk by Dr. James Ryan of the University of Exeter, titled ‘”The ‘Incorruptible Kodak”: Photography, lantern slide lectures and cultures of colonial mission and humanitarianism in the Congo Reform Association, 1904-1911′. 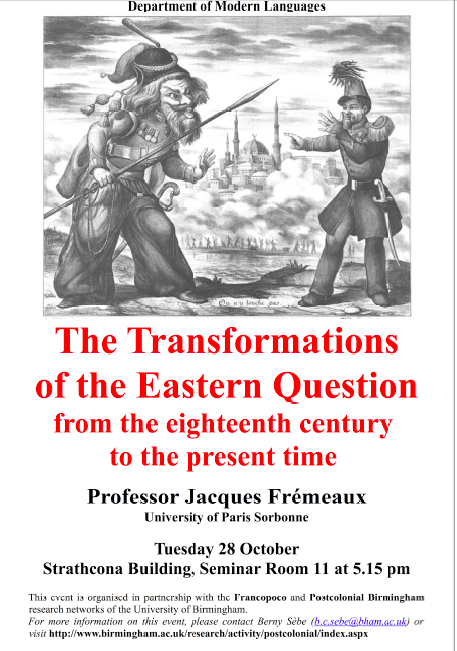 It’s on Wednesday 8 October, beginning at 4:15pm in the Rodney Hilton Library, Arts Building, 3rd floor. All are welcome, and there will be drinks.